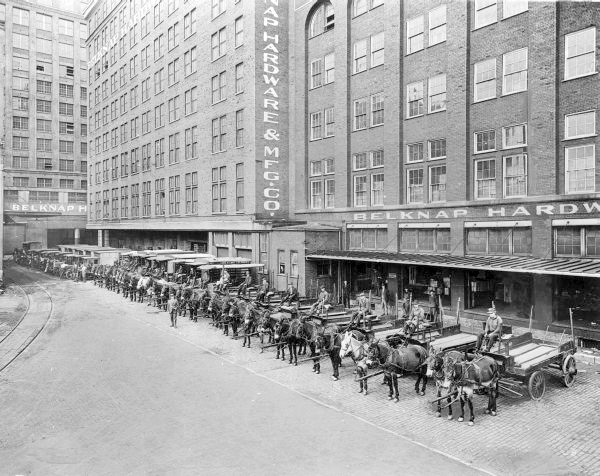 One of Louisville’s largest industrial giants over the years was the Belknap Hardware & Manufacturing Company once located north of Main Street and east of Second Street. While some buildings from its sprawling campus remain as cherished landmarks, others were destroyed in the name of pyrotechnic theatrics. Belknap Hardware was founded in 1880, but the company traced its history back to 1840 when William Burke Belknap started an iron store selling nails and horse shoes on the corner of Third and Main Streets. W.B. Belknap’s son William Richardson Belknap succeeded him in 1880 ushering in the modern era of Belknap Hardware. Over the years, the company grew steadily into a wholesale company selling everything imaginable from hammers and guns to bells and bikes. By the 1950s, the company offered over 110,000 different products and its catalogue spanned some 4,000 pages. As the company grew, so did it’s physical presence on Louisville’s waterfront. One of the buildings remaining today, the Humana Waterside Building, sits where the Galt House once was on First and Main Streets. Additional extant buildings included the Presbyterian Church USA structure and several smaller buildings along First and Washington Streets. Most buildings on the Belknap Hardware site were designed by Joseph & Joseph architects. A system of tunnels and a freight subway system ran under the streets connecting the Belknap Hardware buildings, stretching as far as the J.F. Kurfees Paint Company on Market and Brook Street, a one-time business partner with Belknap. It’s unclear if these tunnels and subways still exist. 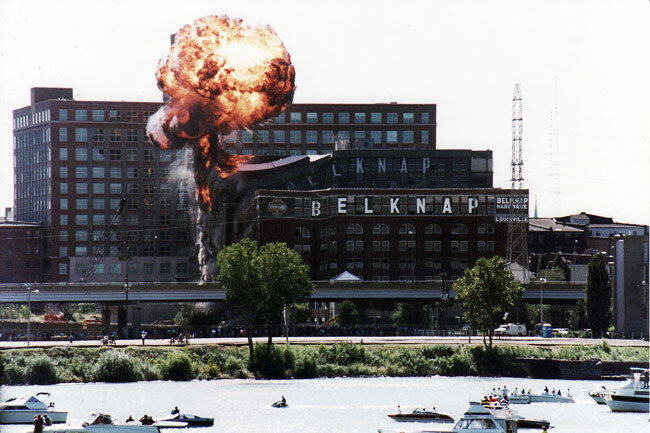 Two of the most impressive structures have been lost, however, in a dramatic pyrotechnic display put on by MTV in 1993 as a promotion for the movie Demolition Man. Special thanks to flickr user SteveBillieJene for allowing us to view these photos of the implosion in progress. Belknap Inc., as it was known after 1968, saw its downfall in rising competition in the 1980s. While it was still making a profit in 1983, the company was sold to David A. Jones of Humana in 1984 for $35 million. Under new ownership, products and employees were dramatically slashed and manufacturing operations were moved out of Downtown and out of Louisville. While it’s fortunate that so much of the old Belknap Hardware facility remains and was put to good use, the destruction of two large warehouse north of Washington Street is still a tragic loss for the city. These concrete structures clad in brick and stone could have been transformed into hip waterfront condos or modern office space much more easily and affordably than building new. Today, the site of these structures is partially occupied by a small park (strangely located next to the massive Waterfront Park) and a small portion of Waterfront Park. Two stone doorways once serving as entrances to the warehouse serve as ghostly reminders to what once stood on the site. Imagine, though, how the area around Washington Street would have been different if these warehouses had been redeveloped instead of imploded. Anyone have memories of the structures when they were still standing? My recollection is that many of the Belknap Hardware Co. Buildings were designed by Graham, Anderson, Probst, and White (successor firm to D.H. Burnham & Co.). Among their other commissions were Chicago’s Merchandise Mart and the Field Museum. Perhaps Joseph and Joseph was the architecture firm of record? Merrill, can you confirm? I’m really curious about these underground tunnels. I wonder if they still exist? I worked at Belknap 1963 – 1968 (less two years in the military). My Dad was there 26 years and my Grandad 43 years. Other family members also worked there. You weren’t going to make a load of money there, but they took care of their employees. When business was real slow (typically in the winter), they had employees in the warehouse sweeping floors instead of laying them off. I started there as a mail clerk, then stock inventory counter, then order clerk and finally a computer operator in one of the best IBM computer installations in Louisville in the mid-sixties.